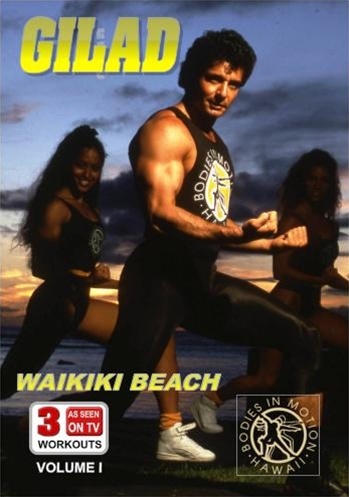 Gilad and the ‘Bodies In Motion’ exercise team are joined by the ‘beach people’ on world famous ‘Waikiki Beach’ with lots of fun and action. Features Gilad, Ora (Gilad’s Mom), Trella, Tracey and Bill. Areas of the day: Hips, Thighs, Buns, Core and Obliques. Features Gilad, Ora, Tracey, Felicia and Jason. Areas of the day: Back, Biceps, Triceps, Outer Thighs, Upper Abs and Obliques. Features Gilad, Ora, Tracey, Gabby and Jim. Areas of the day: Arms (Biceps and Triceps), Inner Thighs, Lower and Middle Abs. I love all the DVDs i bought from Gilad. It is easy to follow and it is so fun to workout with these DVDs daily. Thank you for saving my life. My wife erased #903 from our DVR and thanks to Gilad I was saved. and im still enjoying it working out everyday with GILAD. I love him..he great. i ordered the video as i used to work out to yor show and your sister's show when i was in my 20's, after the birth of my son. i had teriffic results with your program then. you make the workout so easy and fun and the results are spectacular. when i was able to purchase workouts from "way back when" i was so happy, as i knew it worked then and i knwo it will work now. it gave me the power i needed to start working out again. i am now 50, yikes! but want to be in great shape again. thank you for offering your product and YES the shipping time was great; the price was great, you are great! thank you very much, a satisfied customer for many years. you ROCK! Upon opening my box, I found that this DVD had not been included in the order, tho the description marks it as paid for and packaged. I would still like to receive this DVD is the mail, without further cost to me.